These images are from the PDF file for the wall charts. Click on the PDF FILES tab and then PDF files for wall charts... on the sub-menu to get to this file. The charts are to be printed in 11 by 17 inch white paper. The 11 by 17 size is called ledger paper. This set of charts can be used with the following books. 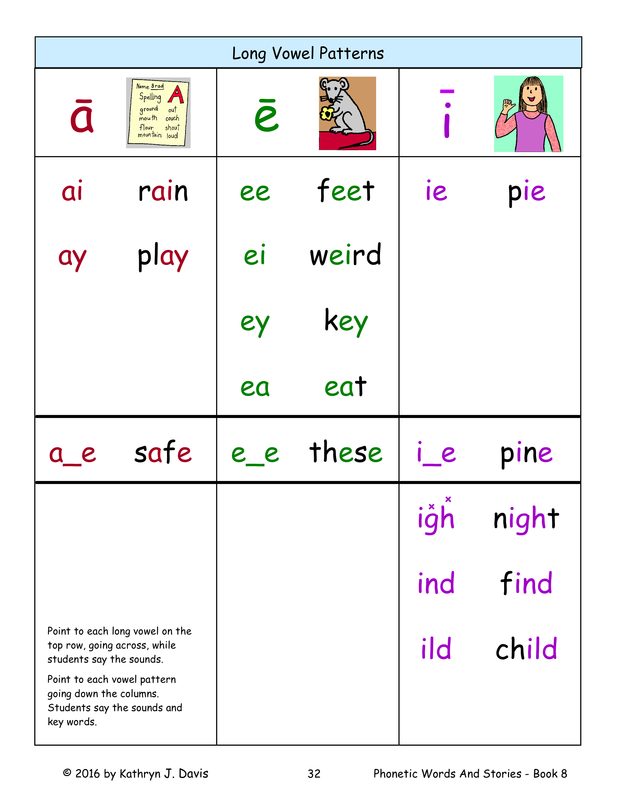 The charts include those needed for the Learning The Alphabet books, Exploring Sounds In Words books, and any of the short vowel books. However, these books need only a few charts, which can be printed separately. You don't need to print the whole set if you don't need them all. The charts require a minimal amount of assembly. Assembly instructions are provided with the charts. Some of the charts are too large to fit on one page. For these charts, you will need to tape two pages together. Some charts have two different versions. 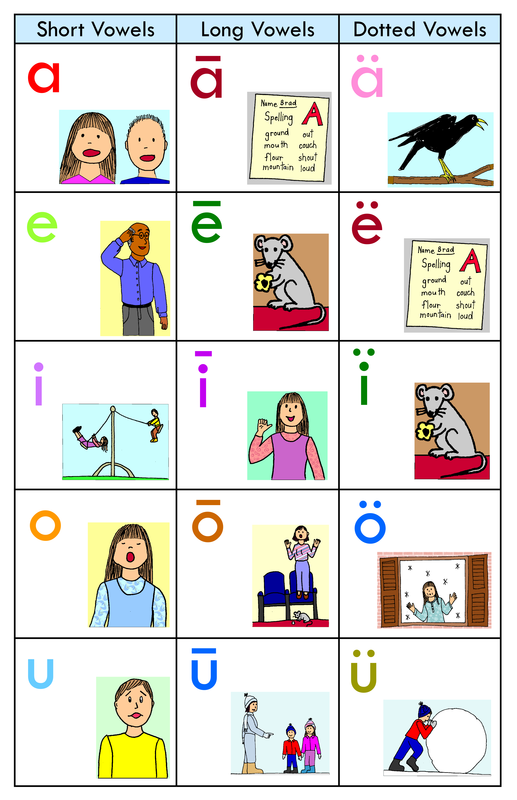 The first version has the letter or letter pattern with sound pictures from the sound story which show the letter sound. 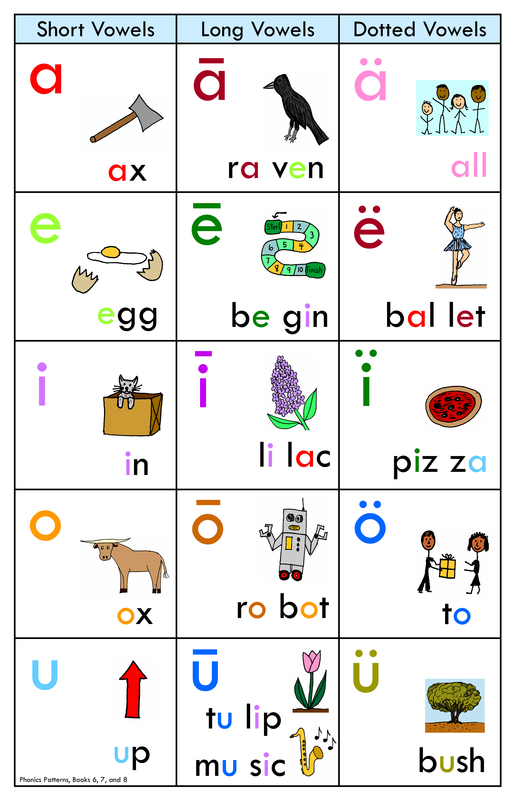 The second version has key words and pictures that illustrate the key words. 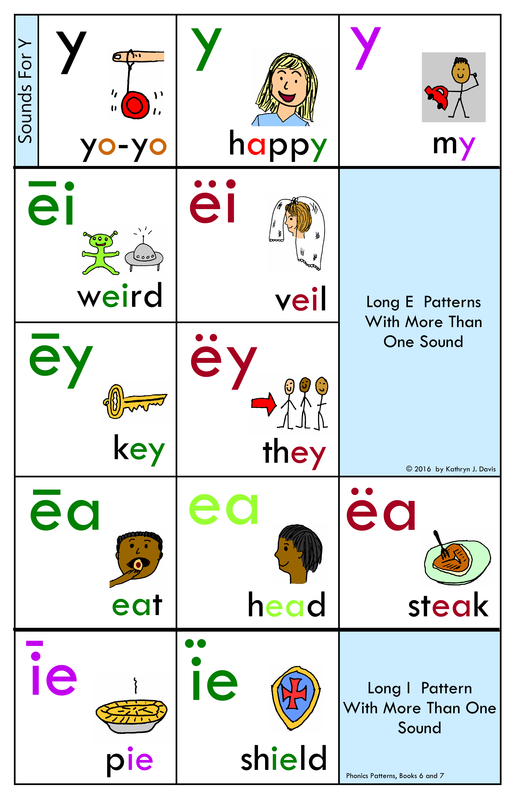 When you introduce new patterns, use the charts with the sound pictures. These will be the easiest for the students. 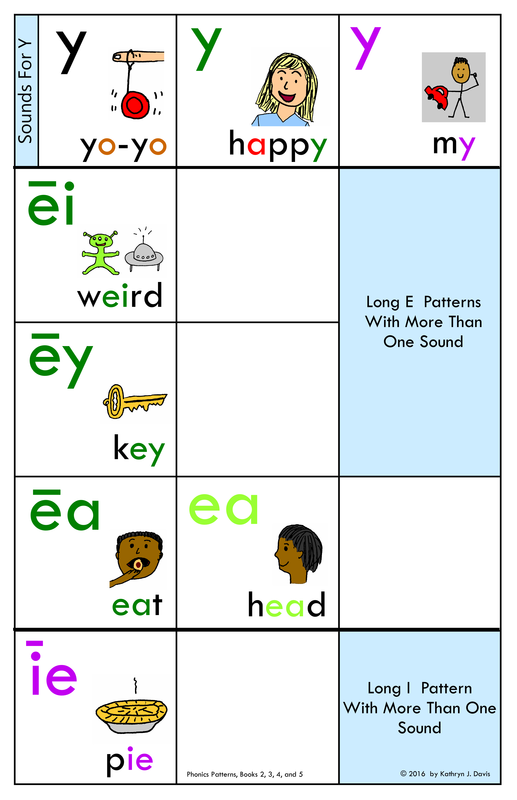 After students have become familiar with the patterns and sounds, you can introduce the charts with the key words. This chart has sound pictures. This chart has key words. Some charts are shown partially filled in the earlier books, with blank areas in the spaces that students have not yet learned. It is easier for students to learn just a few patterns at a time. 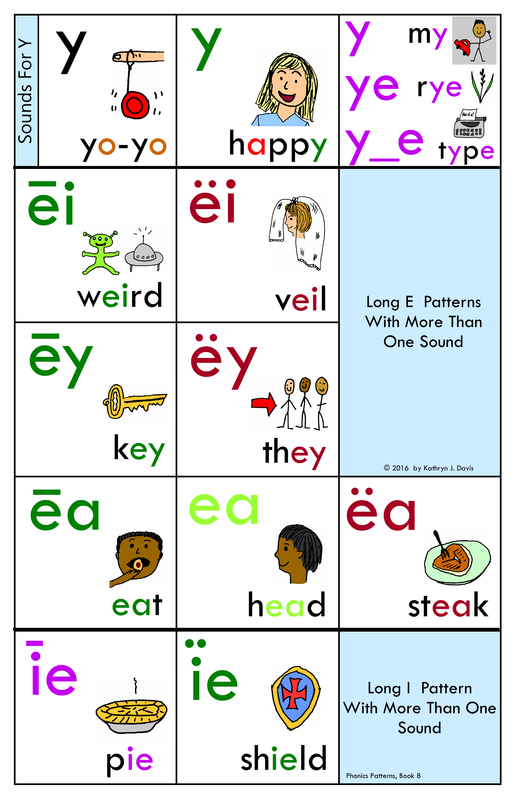 New patterns are added to these charts as students work through the following books. Eventually, by the time students get to the last book, all the empty areas will be filled. I recommend that these charts be mounted on the wall so that all of them currently in use are visible. This allows a quick review of the charts daily. It is very helpful for students to be able to look at the charts as they work throughout the day. You will notice that they refer to them frequently. When students move to a more advanced book and you need a more advanced version of a chart, just tape it over the previous chart. ​​​I do not have pictures of the charts displayed on a wall. You can see images for some of the pages in the PDF file in this slideshow. Bear in mind that some of the pages need to be arranged and taped together when they are placed on the wall.